Get The User Behavior You Want When You Want It! 1) Branding: Integrating gamification into mobile applications for unique value propositions that engage your customer's life with your offering. 2) Behavior Change: New hire integration, workforce productivity, virtual community integration and traditional change management efforts. 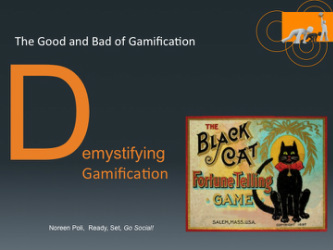 3) Training: Gamification makes use of real time engagement and immediate rewards to reinforce new behavior. This results in faster learnings and greater productivity. Meet users where they are and get them where you want them to go. Resulting in users who are trained, skilled, and engaged! As well as, lower training cost and faster productivity ultimately yielding higher ROI! We know Game Design in Non-Game Settings. Effective use of game elements to reinforce behavior, such as short intervals, leveling up, and linking desired behavior with productivity can deliver lasting behavior in relatively short time periods. We specialize in identifying KPIs for specific goals to dial-in measurable results then use quick iterations to yield success.